Want to be notified of new releases in VirtoCommerce/vc-theme-b2b? 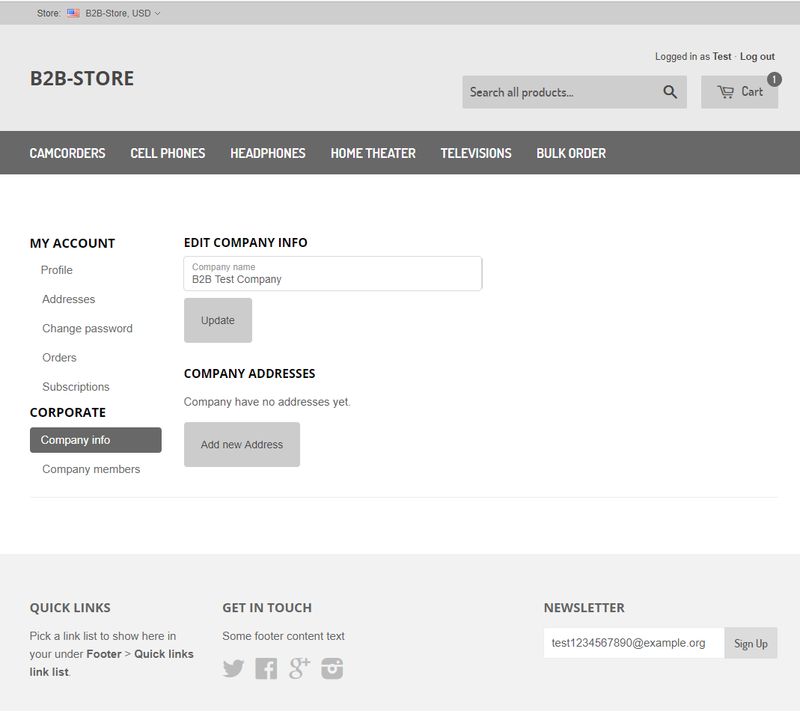 B2B theme for VirtoCommerce Storefront used by B2B-Store sample store. It is a showcase for b2b features support of VirtoCommerce. In Visual Studio, go to Team Explorer → Clone → Enter https://github.com/VirtoCommerce/vc-theme-b2b.git as URL and C:\vc-theme-b2b (for example) as path. (where C:\vc-theme-b2b is path to folder where you want to clone repo). (where C:\vc-platform\VirtoCommerce.Platform.Web\App_Data\cms-content is path to CMS content storage configured at platform & storefront deployment steps, 'B2B-Store' is your store name and 'C:\vc-theme-b2b' is path to your theme repo). 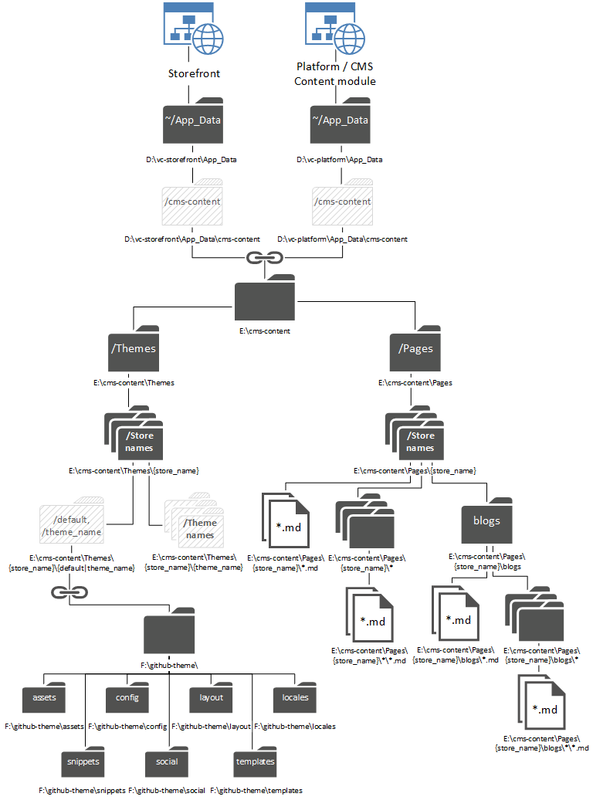 Select C:\vc-theme-b2b (where C:\vc-theme-b2b is path to folder where you want to clone repo) and open it. In Visual Studio all dependencies will be installed automatically. Just wait a few minutes. You need to have local installation of storefront. Follow this article step-by-step to install storefront from binaries or source code. Add app setting VirtoCommerce:B2B:ApiEndpoint and set its value to URL of B2B module API endpoint (usually the same url as for admin site) with slash as last symbol. B2B Extensions module must be installed. If you have Visual Studio 2015 with Update 3 and above, you don't need install any prerequisites. Latest versions of Node.js and Gulp already included in your Visual Studio installation and supported in built-in Task Runner Explorer. 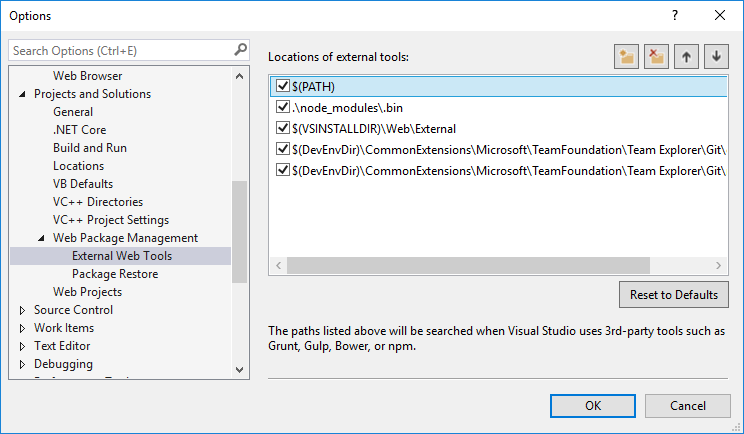 Task Runner Explorer, Node.js and Gulp already included in your Visual Studio installation. However, you need update your Node.js to at least 4.0.0. Update Node.js to v4.0.0 at least (we recommend latest LTS version). Use C:\Program Files\nodejs installation path (change Program Files to Program Files (x86) on 64-bit machine). Liquid is the templating engine that powers Virto Commerce templates. Go to Liquid documentation. append_version is used to correctly invalidate browser cache for bundles. It calculate hash of file and append it as part of query string in url. Make sure that it's added after static_content_url (or other url filter), not after script_tag, stylesheet_tag (or other html tags). CSS processes by Autoprefixer with the following browsers support (documentation may be sometimes outdated; browser versions specified in gulpfile then specified in docs, not vice versa). 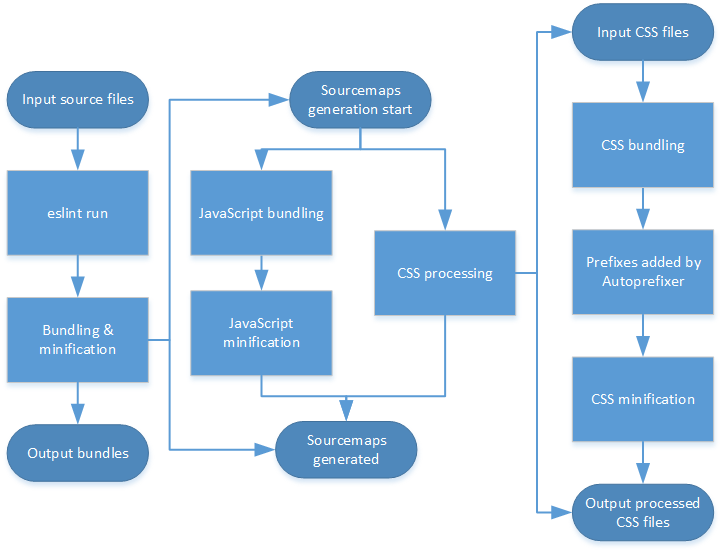 CSS minifies and source maps generates. Bundling & minification will work automatically when you save file and on build. Bundling & minification will work automatically on build. If you want to automatically bundle & minify files on save, please, install & configure Blade Runnner Visual Studio Code extension. manually when you need to bundle & minify theme files. Attention: while theme including bundlesconfig.json file, you must not use Bundler & Minifier Visual Studio extension with theme. We're using gulp to bundle & minify files on theme, because it support a lot of possible customizations and has a plugins for css minification and correct source maps generation. Wrong source map generation and lack of css minification is a primary reason why we do not use Bundler & Minifier extension in Visual Studio. default: default task. Bundles and minifies theme files. clean: removes bundled & minified files. min and min:js, min:css, min:html: minify all or specified types of files. watch: watching to any changes on bundled & configuration files and update bundles when any change occurs. compress: creates zip package with all needed files to deploy theme on storefront. Storefront theme localization is very similar to VirtoCommerce Platform localization. Check it for details on working with translation files. Rename the copied file to begin with your needed language 2 letter code (e.g., "es.default.json"). Open your store in VirtoCommerce Platform ( More → Browse → Stores → <your store> ).